Shugyo has three branches in the Sydney region. One in Balgowlah, one in Curl Curl and the third in Currans Hill. The instructors have decades of experience in training and teaching Taekwondo. 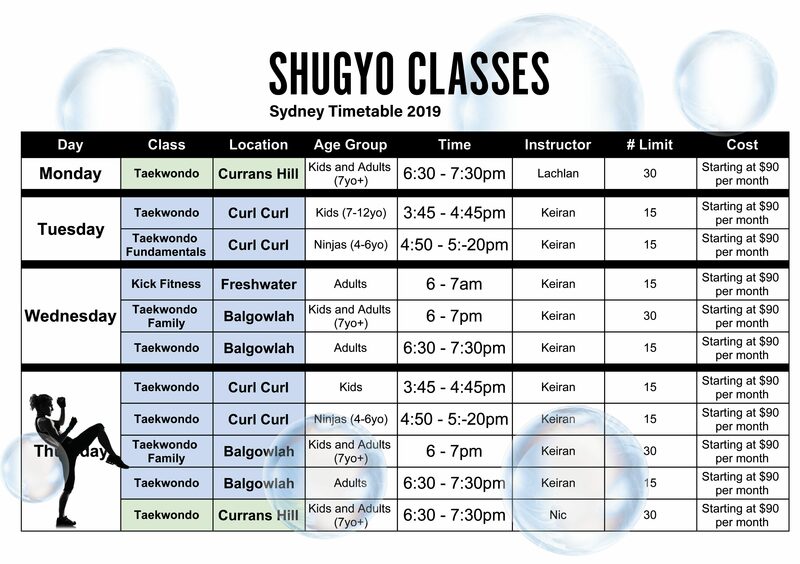 Shugyo Curl Curl is run by Instructor Keiran, who has been a taekwondo instructor for 10-years and has competed at an international level. In Curl Curl, you’ll find a small hall with a maximum of 15 students so you can be guaranteed time with the instructor. There are classes for 4-6yo kids which run for 30-minutes and have a focus on fun, while teaching discipline and increasing your child’s attention-span. The next class is for Kids aged 7-12yo. These are a little more formal and run for a full hour. The focus is on slow, sustainable growth in skills. We build our students up in a supportive and encouraging environment, fostering intrinsic motivation. Games are played to teach skills without the children realising that they’re learning. These classes are structured one-hour kicking feasts. You’ll learn the basics of leg control and one day know how to use your legs to defend yourself, or even better, do those wicked kicks you see in movies. You’ll leave the ground regularly during class and you’ll leave class satisfied you’ve worked your whole body. Our family classes are run in Balgowlah and have all the objectives of the Ninjas and Kids sessions, except you get to do it with them. Don’t worry, this isn’t daycare, you’ll get a workout too. The high energy in Instructor Keiran’s sessions will leave you sweating most classes. Meanwhile you will be learning a skill set which will teach you self defence and have you achieving alongside your kids – is there a better way to bond? Plus: the Australian Sports Commission says kids who train with their parents, are much more likely to stay active through their teenage years. In Currans Hill, it’s all about the families. Bond with your kids by starting a journey in taekwondo that may end up seeing you travel together. Our branches in Tonga and Auckland hold regular camps. The rewards for training are endless. Your training will help you discover a lot about yourself and it’s likely you’ll fall in love with the process. Each class you’ll build on the previous sessions, meaning you will build your fitness from the ground up. We injury-proof your body with carefully designed activities designed to leave you feeling great. You’ll learn body awareness, increase your flexibility, gain new skills and meet some incredible people who love training hard. Give instructor Keiran or instructor Nic a call today to find out about your free trial class! Please note: Sessions average rate is $10 per hour on this plan AND absorbs quarterly Grading/Benchmarking costs. BJJ Gi’s sold separately. Any further casual sessions are charged at $10 per hour.